As you can see, this is a screen shot of an article featuring a screen shot of this blog, Gates of Vienna. The article captured by NRK was posted here the previous night (May 31, 2012). It described Fjordman’s decision not to testify by Skype at the trial of Anders Behring Breivik. 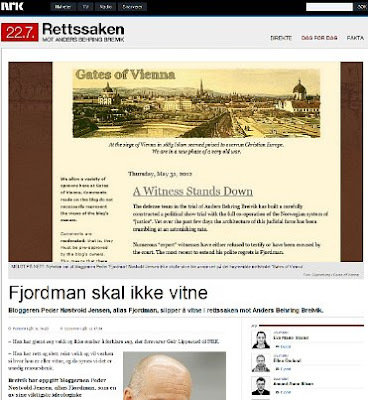 Blogger Peder Nøstvold Jensen, alias Fjordman, does not have to testify in the trial of Behring Anders Breivik. He is in hiding, and does not wish to testify, defense counsel Geir Lippestad said to NRK. This was simply a rehash of what Hans Rustad had posted at Document.no, a translation of which we posted here. The defense counsel, of course, has spun Fjordman’s departure from Norway as being “in hiding”, rather than “in exile from his homeland, which has become a totalitarian state”. But that’s Mr. Lippestad’s take, and reflects his own choice — he, after all, has chosen to serve the modern multicultural Norwegian state. He lives in Norway, and earns his daily crust from the oppressive system that drove Fjordman into “hiding”. We cannot expect him to be able to conceptualize the dire condition into which his country has fallen — and which Fjordman has described so aptly in his numerous well-researched essays — much less work to overcome it. For some reason NRK decided to feature our blog as a source for their article. We were not the first to carry the news — Hans Rustad of Document.no broke the story — but perhaps the editors felt a need to emphasize Fjordman’s “foreign connections”. Or maybe they were engaging in more of the ridicule we’ve heard about — it’s hard to tell from machine translation. It’s fine with me if they intended to mock and/or discredit us. Do your worst, fellows! Because whenever you do something like this, the thousands of Norwegians who read your article that morning over their Wheaties later google “Gates of Vienna” and find our stuff. And I know they don’t just read the NRK-featured article, because our page-views skyrocket every time we get one of those norge-lanches. The new readers work their way through our archives — especially the Fjordman posts. And the ones who are secret dissidents keep coming back. We can tell that because of the comments they leave. Ever since the Breivik crisis last August, Norwegians have been well-represented among our commenters. Virtually every night they leave brief summaries of pertinent Norwegian-language MSM articles in the news feed, and they often participate in the comments on posts about cultural enrichment in Norway. So the meme propagates, thanks to NRK and Dagsavisen and VG Nett. The Norwegian media have given us a leg up, and we owe them a debt of gratitude for that, communists or not. Most of my regular Norwegian contacts and translators are exiles, like Fjordman. Some of them have left the fjords to escape the stifling political repression that now rules in their home country. Others emigrated for non-political reasons, but once they were out from under the yoke of janteloven, they experienced a sense of liberation from the oppressive Nordic consensus and discovered the joy of thinking for themselves. It’s not a good sign when the most vigorous and open discussion occurs among a country’s exiles. The fact that there is virtually no public dissent within Norway itself against the consensus — that only exiles engage in it freely — is a sign that Norway has become a full totalitarian state. No gulags, no firing squads — those aren’t necessary. Given the right conditions, the total suppression of officially unacceptable opinions may be achieved without any violence whatsoever. Mind you, show trials and the local equivalent of Pravda are still required pieces of totalitarian furniture, as Circus Breivik has demonstrated all too clearly. You can’t run a totalitarian state without the customary rituals and litanies. This blog did not set out to become a haven for Norwegian dissidents. It just ended up that way, over the course of five or six years, as disgruntled Swedes and Norwegians took an interest in the translations, the news stories, and the free-ranging discussion in our comments. We accumulated more tipsters, more translators, and more correspondents, and the whole thing snowballed. By the time Breivik did his deadly work, we had become a prime target for elite Scandinavians who longed for an excuse to suppress their exiled dissidents. I’ll leave it to the experts to determine whether Breivik was weaponized in advance to target the “Islamophobes”. From our point of view, it doesn’t really matter — the effect would have been the same in any case. The media came down on us like a ton of bricks, and if I had had any career left, I would have lost it as a result. But we’ll just keep on doing this as long as we can — until Obama or someone like him has his way and Europeanizes the United States. We have become the equivalent of Radio Free Norway. It’s not something we wanted or intended, but the job fell to us anyway. We beam our signal into the oppressed fjords and snow-covered uplands so that ordinary Norwegians can realize that yes, there is another point of view besides the one they are spoon-fed by NRK and Dagsavisen. That saving their culture is a moral necessity for all Norwegians. And someday, when things go sideways here, we may need a Radio Free America. Or, in a post-federal time, Radio Free Virginia. It’s important to point out that Gates of Vienna is far from the only outlet beaming the truth into Norway. Among other stalwarts, we have Vlad Tepes, Tundra Tabloids, Europe News, Snaphanen, Politically Incorrect, and numerous other blogs and websites, all broadcasting the words of exiled dissidents into the totalitarian heartland. It turns out that more and more people are looking for news sources independent of the MSM, which used to be the only source before internet. CNN once used to be the source you'd look up to find what was going on where. Based on reports some time ago, you'd wonder who are CNN's audience today? Indeed, people need their Radio Free Everywhere. Isn't it interesting how none of these msm people ever discuss the significance of the name of the blog? Islamic armies invading mainland europe? That can't be right can it? Just an FYI: there already is a Radio Free Texas operating online, run by the current President of the Texas Nationalist Movement, tho it plays Texas-based country music, it did have a sister station that aired political discussions. Best alternate is the Texas Overnight program that plays weeknights on KRLD in Dallas, hosted by Charley Jones, for current events discussion and commentary, tho it starts at midnight and runs until 4AM. Precedence cascade about to strike. When it happens, the left (and the MSM) will be shocked. Slack-jaw, drooling, incomprehensibly shocked. How about that! I should have known, given that it's Texas.